Low Carb Pizza Crust | Domino’s Style Pizza! Believe it or not we have perfected another pizza crust and this time we aren't messing around. Compared to our other crusts, this Low Carb Pizza Crust closest resembles a standard Dominos pizza crust, so you're going to want to try this recipe! Check out Matt make it below so you too can indulge in some guilt-free, low-carb pizza! Use this Crust to Make the Best Keto Pizza Recipe! Are you missing pizza Fridays or having family and friends over for the big game? Use this crust to make the best pizza recipe and quit missing out on all the fun! What's great about this crust is that no matter how you like your pizza, thin or thick crust, (I'm personally a thin crust fan and Matt likes his crust thick) you can make it to your liking. This crust recipe is just like normal dough that you would roll out with your hands or a rolling pin. So go ahead, roll it thin or thick and have it your way every time. Which One is the Best Homemade Pizza Crust? We know our chicken crust pizza is a favorite of many, but if we had to pick our favorite out of all the low-carb pizza crusts out there, we would definitely pick this! In our opinion, it makes the best pizza by far. Make it for family and friends when they come over and they won't have any clue that it's low-carb and keto friendly! Don't hesitate to change up the seasonings in the crust if you prefer more spice or less flavor. At this point you might be wondering what your options are. Well, you've got your chicken crust as mentioned above, then there is cauliflower, fat head, deep dish, and even skillet pizza, where you fry cheese right on the stove top. And, if you're a pizza lover like myself, you may want to give all of them a try! However, if you're looking for the ultimate pizza crust when it comes to taste, texture, macros and being brought back to your pre-keto days this low carb pizza crust will do the trick, and then some! Note: In the video we make a simple tomato, mozzarella pizza and top it with some walnuts. The crunch and flavor really adds to the pizza and we highly recommend it! 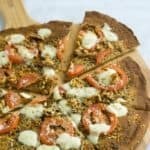 Recipe can be quickly added to MyFitnessPal - Search "KetoConnect - Low Carb Pizza Crust"
Combine the coconut flour, psyillium husk powder, yeast, baking powder and salt in a bowl and combine. Set aside. In a large bowl whisk together the olive oil, water, and four eggs. Slowly add the dry to the wet ingredients as you combine using a spatula or your hands. The final product should be pliable like dough and not too sticky. If it not dough like add some additional psyillium husk powder. Allow the dough to sit for five minutes. Place the dough onto parchment paper and place an additional piece on top. Roll out the dough to the size and thickness of your liking. The thinner the crust the crisper it will get. Transfer the crust to a baking sheet and, optionally, push the edges up to form a crust for the pizza. Spread the seasonings onto the crust evenly throughout and press it into the crust. Bake at 350 degrees for 25 minutes (without toppings). Top with favorite toppings and bake at 350 for an additional 10 minutes or until toppings have melted and edges have browned. Enjoy! Tip: This crust could be baked and frozen for dinner throughout the week!